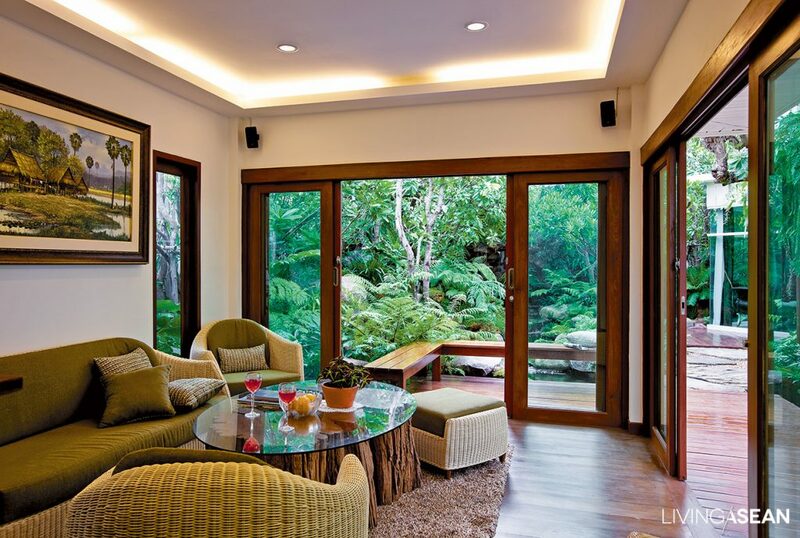 Rainforest ecology is the design concept here, the verdant lushness associated with tropical jungle. 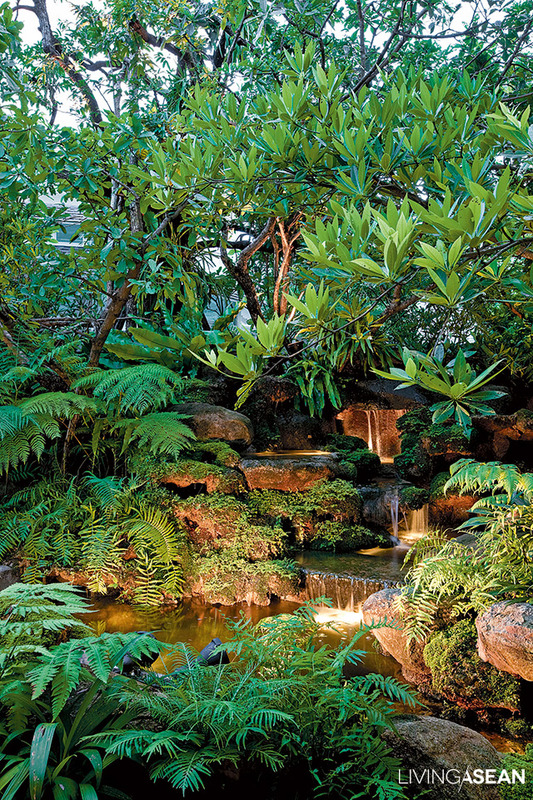 Use high-tolerance plants that adapt themselves to the natural environment and don’t require a lot of long-term care. 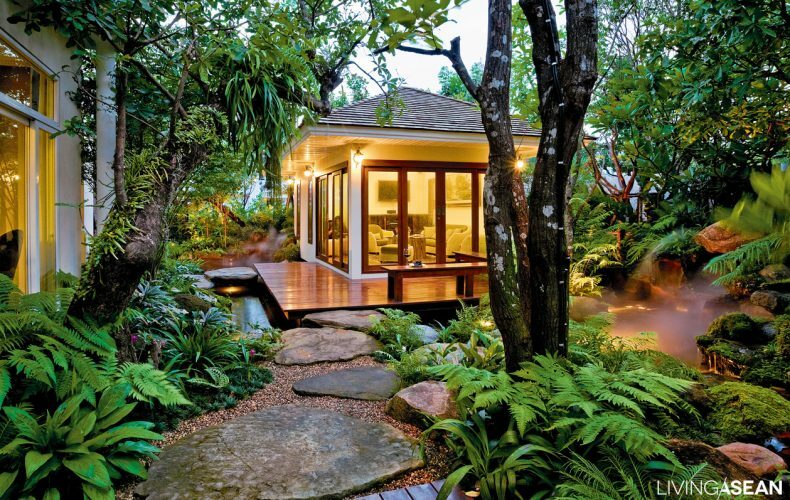 Here emphasis is on the garden: the designer has removed the house from the diagram to focus on the surroundings, revising and reapportioning them to bring back the feeling of the rainforest that was once there; the house will be added later. 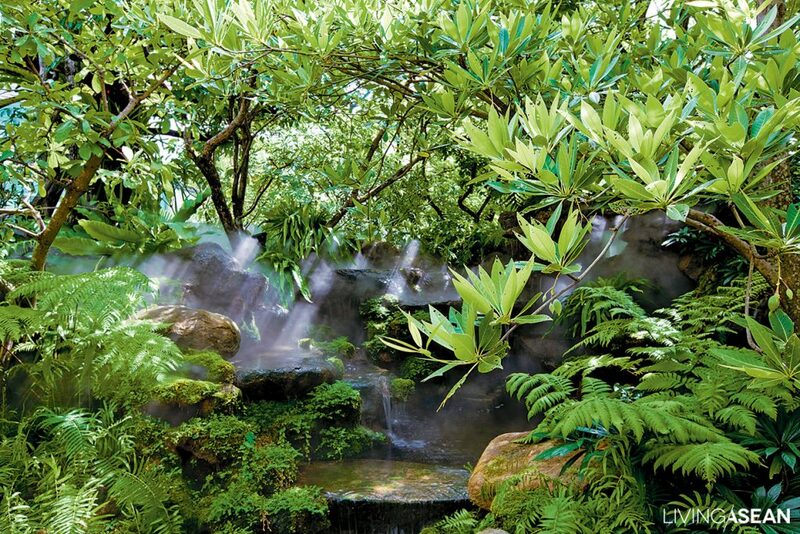 The owner’s first concern is creating a waterfall, pond, and gazebo for relaxation; only then will the concept be enlarged to include a house in a supporting role for the garden, enabling the owner to fully enjoy this creation. 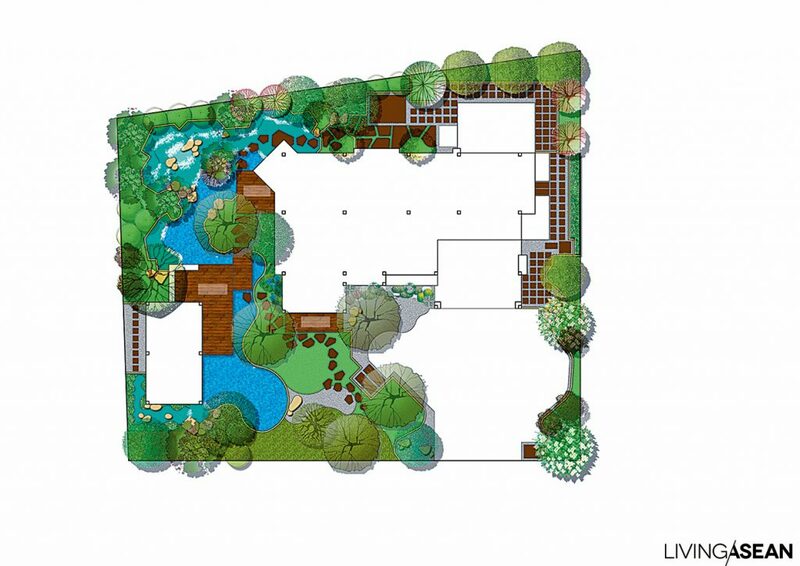 Garden design deals with three primary levels: low, medium, and high. 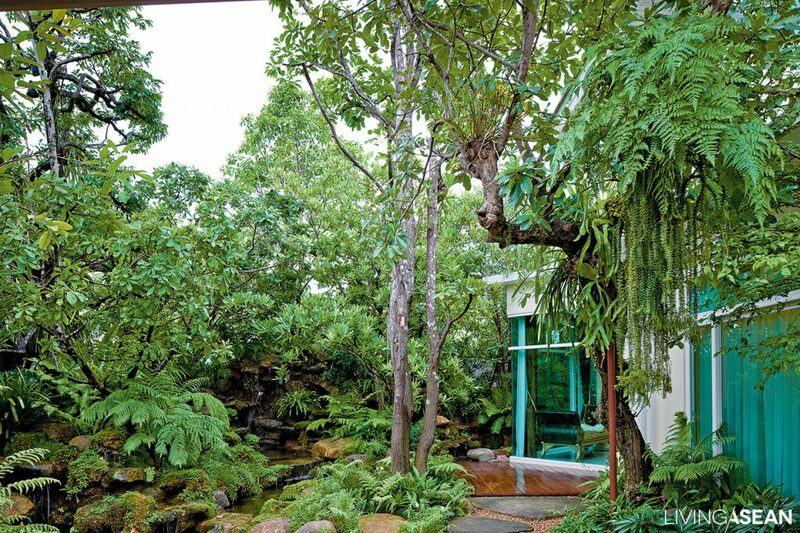 A forest atmosphere is created visually through using the natural lines of the plants. Trees are the highest, rising up above, but freshwater mango can be a slightly lower exception with curves leaning together, arbor-like and welcoming, above the house entryway. Plants of middle height running along the fence can add privacy. 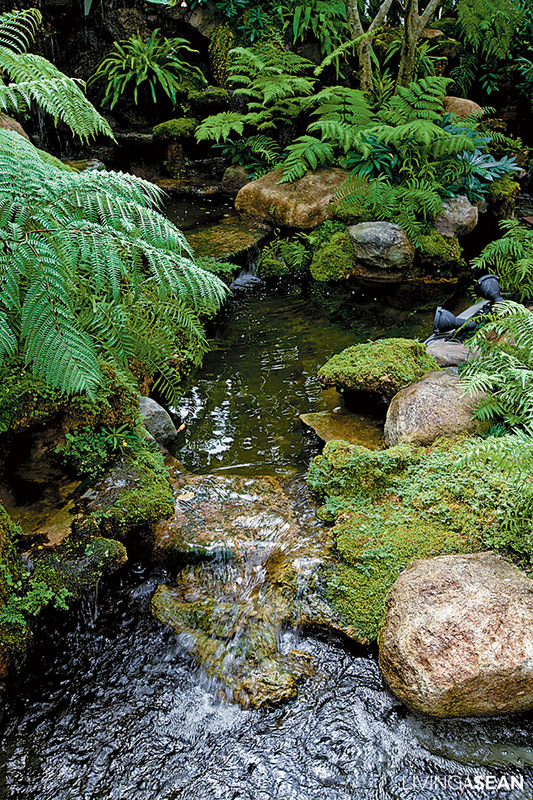 For ground cover use plants with wavy and sinuous lines set at natural-looking intervals, closer to the water source perhaps ferns, and further downstream plants requiring less moisture. Think of the stages of a natural waterfall: first is seepage, small drops descending along crevices in the rock; these eventually join and flow into a larger falling stream. 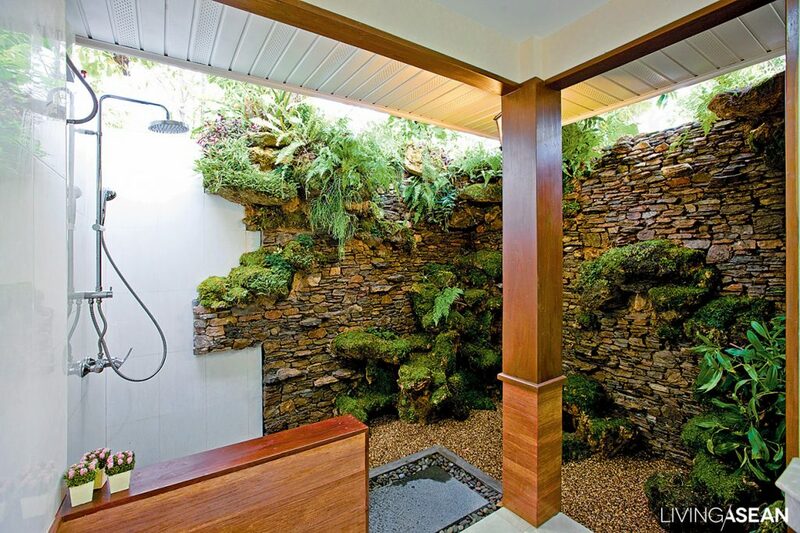 The waterfall should not be so high that it could get the house wet, and it should give off a soft, restful sound. Because of space limitations, trees should be put in before the waterfall framework is built, otherwise there won’t be space for any large roots. Ponds should be designed about 0.8 to 1 meter deep. Waterfalls are usually built using 2 types of stone: granite and porous volcanic rock.